In this trilogy thriller, forensic sculptor Eve Duncan is still the prey of a vicious killer. She was taken for a reason. Chosen for her skills as a forensic sculptor. Abducted by the deranged father of a serial killer and forced to reconstruct his dead son’s skull from bone fragments. Now Eve Duncan has escaped her captor—and she’s running for her life. Alone. Unarmed. In the mountains of Colorado, Eve must use all of her strength, courage, and wits to survive this madman’s obsession. But Jim Doane is not the only player in the game. While Joe Quinn, Jane MacGuire, and Kendra Michaels search for Eve in the abandoned mining town that could be her ultimate refuge—or her grave—a stranger with ties to her long-ago past is closing in, circling like a wolf, and Hunting Eve. I’m a big Iris Johansen fan and I couldn’t wait to get started on this trilogy. This is the second book in the series and I was not disappointed. This one was just as good as the first book in the series called Taking Eve. Full of suspense it made for on-the-edge-of-your-seat reading. I could not put it down. I follow all of Johansen’s Eve Duncan books and have enjoyed them all. This was good reading – it moved along quickly with lots of action. I’m getting ready to read the last of the trilogy, Silencing Eve and I can’t wait to delve into it. I’m really looking forward to finding out how it’s going to end. If you like thrillers, you may want to check the Eve Duncan books out. I feel you won’t be disappointed. Initially set in the early 90s we are introduced to teenager Emily Vidal at the scene for her father’s 50th birthday party. When she later stumbles across her father embracing their next door neighbor she’s not sure how to react… especially since it has only just recently been revealed that her parents will be getting a divorce. In the midst of all this Emily witnesses one of her neighbors committing suicide and this (understandably) impacts her significantly. The Adults follows Emily’s path to “adulthood” while making it clear that there is never really a time when we truly become adults and completely leave childlike tendencies behind. The novel goes from Emily’s first year in high school to a few years beyond college. Emily has struggled to find herself while also being supportive of her parents and pining for a relationship that began way too early in life. I enjoyed this book, which also happened to be Espach’s debut novel. I appreciated that the author received her MFA from Washington University here in St. Louis. It wasn’t a dense book, but it wasn’t something I found myself racing through. There were parts where I laughed out loud and there were parts I could definitely relate to. We’re in the mind of a young woman as she grapples with the world around her and tries to find her place in it as an “adult.” Something that isn’t always that easy. While I would recommend the book, I didn’t realize it was going to be a series and so the book doesn’t really end, it has a huge “To Be Continued.” The other thing I didn’t like about the book is what makes the book unique, the pictures. I felt that the author tried too hard to incorporate very random strange old pictures into the storyline. I didn’t feel like they added to the novel at all and the pictures sometimes took you out of the story in an awkward way. You can also check out Kelly’s review. I didn’t love this book. The writing was annoying at times and seemed much more juvenile than other young adult books that have become popular, most specifically The Hunger Games. It was hard not to compare these two novels because of their similar themes and the strong female heroine. Divergent fell short. Its story was not one that pulled you in like The Hunger Games did. You can also check out reviews of this book from Julia and Sadie! Deep Comedy is an exercise in philosophy, historical theory, and literary criticism – all guided by theological intuitions. Leithart makes the claim that with the advent of Christendom came a remarkably hopeful or comic understanding of the trajectory of human history. He sees this perspective on history as being deeply informed by and connected to Trinitarian theology. This connection is made through an admittedly nuanced and, at times, difficult to grasp argument about the nature of the Trinity and the view of history that Leithart believes flows from the doctrine. The significance of this kind of “deep comedy” is illustrated through contrasting the essentially tragic take on human history expressed by the ancient historian Hesiod and ancient dramatist like Homer and Virgil with the deeply comic vision of Shakespeare’s plays. Leithart traces this ancient sense of tragedy through postmodern thinkers like Derrida and tries to show that Trinitarian orthodoxy offers an alternative and more hopeful account of history. Leithart covers a lot of ground in this short book, but I think he manages the task remarkably well. It is interesting to note that though the book is scholarly in tone and format, he claims that it is actually “more an impressionistic essay than an academic treatise” (xv). This upfront acknowledgement helps to mitigate what might otherwise be overgeneralizations about the differences between Greek and Roman theories of history and literature on the one hand and European Christian views on the other. His case is effectively that the peculiar doctrine of the Trinity has had a deep and observable effect on the cultures that have assimilated its story and logic, and I think he argues it brilliantly. One of my favorite aspects of Leithart’s work is his consistent ability to draw imaginative and fruitful connections between disciplines, and that is precisely what he does in this book. His observations about the differences between the nature of Greek and European tragedies are far from unique or new. However, his explicit connection of these differences to Trinitarian logic is remarkably creative and contains serious explanatory power. I’ve read a lot from Leithart, but this may be my new favorite among his books. The literary analysis of Shakespeare’s King Lear and Twelfth Night in the final chapter is particularly worthwhile, and it should be valuable to Shakespeare fans even if they do not buy the broader argument of the book. Raised primarily in Ireland it was interesting to get an inside look at what life was like as the child of a famous director. We also get a look at how she initially resisted acting after working under her father and decided to enter the world of modeling. Hearing her list some of the photographers she was photographed by made me request a number of books to check out their work. She also introduces the reader to her love life which started early and revolved primarily around older men… The book ends with Huston in her early 20s in California about to enter the Hollywood life. There’s no question Anjelica Huston’s life was an interesting one, I just don’t think it came across well in the book. Perhaps when someone does a biography on her later it will be able to better capture her experiences. I didn’t feel really invested in her life or attached at all to any of the people she mentioned. The audiobook was narrated by the author which I thought would be a great way to “read” the book but I don’t think Huston did that justice, either. It really irked me when words were mispronounced (unless there are other ways of saying “turquoise” and “daquiri” that I’m not aware of). If you’re a big Huston fan you would still appreciate this book. I might still pick up the memoir coming out in the fall because that will better highlight the parts of her life that I think most people will remember and want to hear about. Fiction · Gwen B · In the Library · Juvenile · Quick Read! Crayons have feelings, too, in this funny back-to-school story illustrated by the creator of Stuck and This Moose Belongs to Me — now a #1 New York Times bestseller! What can Duncan possibly do to appease all of the crayons and get them back to doing what they do best? 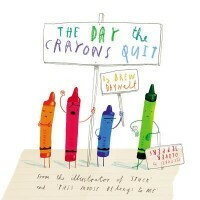 Kids will be imagining their own humorous conversations with crayons and coloring a blue streak after sharing laughs with Drew Daywalt and New York Times bestseller Oliver Jeffers. One of our reference librarians, Julia, ordered this book for our collection here in the library. Wow! Did she make a good choice for our juvenile book collection. A co-worker of mine told me she had ordered it for her grandsons because she liked it so much. So I was curious to see what she liked so much about it. It took me about thirty minutes to read it. And every one of those thirty minutes was worth it! This book is LAUGH OUT LOUD funny! Duncan’s crayons have complaints which they convey in a series of letters. What makes it so funny is that it’s so true. I can imagine each color crayon really having these complaints. Red and blue ARE overworked, pink probably IS ignored by a boy, and beige is right, when was the last time you saw a kid excited about coloring wheat? The author, Drew Daywalt, hits this one WAY out of the park with some of the most clever, touching and hilarious text I’ve ever seen in a children’s book. This is an awesome book! It’s about a boy named Duncan who has an unexpected discovery one day at school. His crayons have all written him letters of complaint! Grey crayon is tired of coloring in all those large animals–elephants hippos, whales; Black crayon is tired of only being used to outline other colors; Blue crayon is just plain tired; Green crayon is happy enough but he’d like to intervene on behalf of his friends, Orange and Yellow, who are currently not speaking to each other as each claims to be the true color of the sun; and Pink and Beige feel frankly ignored.